As a young legal advocate, Ginger Lerner-Wren bore witness to the consequences of an underdeveloped mental health care infrastructure. Unable to do more than offer guidance, she watched families being torn apart as client after client was ensnared in the criminal system for crimes committed as a result of addiction, homelessness, and mental illness. She soon learned this was a far-reaching crisis—estimates show that in forty-four states, jails and prisons house ten times more people with serious mental illnesses than state psychiatric hospitals. 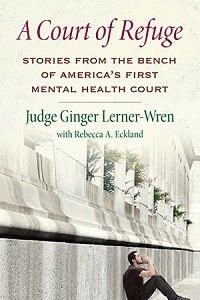 In A Court of Refuge, Judge Ginger Lerner-Wren tells the story of how the first dedicated mental health court in the United States grew from an offshoot of her criminal division, held during lunch hour without the aid of any federal funding, to a revolutionary institution. Of the two hundred thousand people behind bars at the court’s inception in 1997, more than one in ten were known to have schizophrenia, bipolar disorder, or major depression. To date, the court has successfully diverted more than twenty thousand people suffering from various psychiatric conditions from jail and into treatment facilities and other community resources. Working under the theoretical framework of therapeutic jurisprudence, Judge Lerner-Wren and her growing network of fierce, determined advocates, families, and supporters sparked a national movement to conceptualize courts as a place of healing. Today, there are hundreds of such courts in the US. Poignant and compassionately written, A Court of Refuge demonstrates both the potential relief mental health courts can provide to underserved communities and their limitations in a system in dire need of vast overhauls of the policies that got us here. Lerner-Wren presents a refreshing possibility for a future in which criminal justice and mental health care can work in tandem to address this vexing human rights issue—and to change our attitudes about mental illness as a whole.